How long did your wine clock take? Is the time remaining in UGS Accurate ? I had to pause mine last night, I hope it picks up where it left off. It had sent about half the lines. I will have to look when I get back home, my old brain isn't what it used to be. @PhilJohnson I used your single pass settings from the other thread, only change was 30 degree bit. I think it came out well. still wrapping my head around the template. Do you use it to cut just the pocket or for also cutting the outside edge? 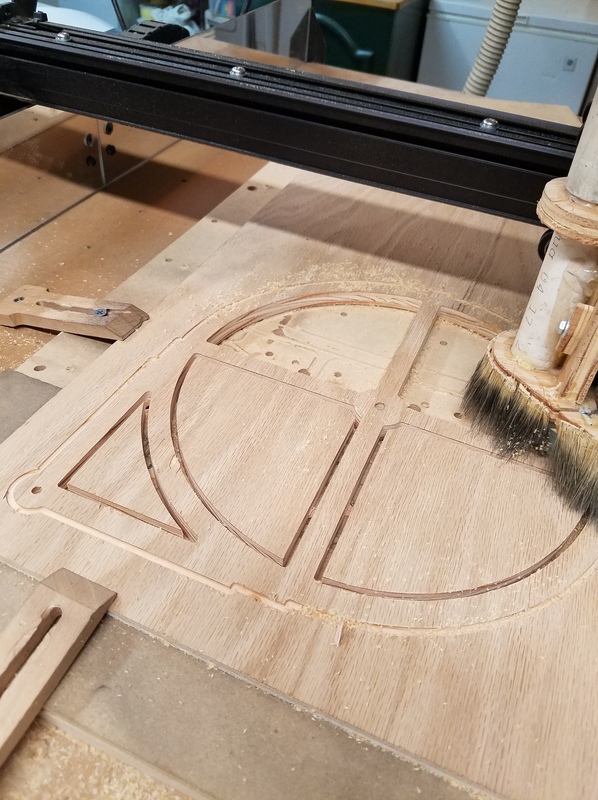 flip the clock over use the template to find the center by jogging the machine. take those X & Y coordinates and use them to center the pocket in easel. Then do the same for the outside cut. Wish me luck. Have you tried your sanding sealer (Minwax water based) on a paint filled carving yet? How did it work for you vs the shellac method? Good to hear. I'll try the water based sealer when I run out of my lacquer based sealer. Less fumes will be a good thing. Hours spent trying to figure out how to center the pocket and the outside cut. Easel wont let you pick a different home position. So got the outside to cut where I want, if I cut it from the front. still not sure how to get the pocket centered on the back. I suppose after I cut the circle i can tell easel the round part is an 11" square. Must sleep now my brain hurts. 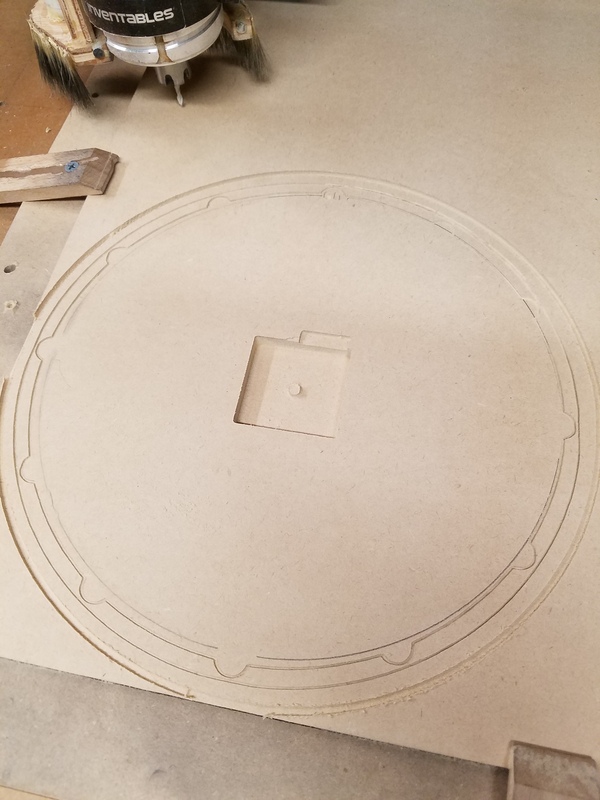 Thanks Phil I realized that after a few hours of staring and moving things around laying the template ontop trying to measure things. Then it was like a light bulb went on. You are exactly right I was over thinking it. As far as I can tell easel always wants the lower left corner for a home position. Every time I start a carve it moves from the lower left. Am I missing something? over thinking again, man that is simple. thanks again or the help. 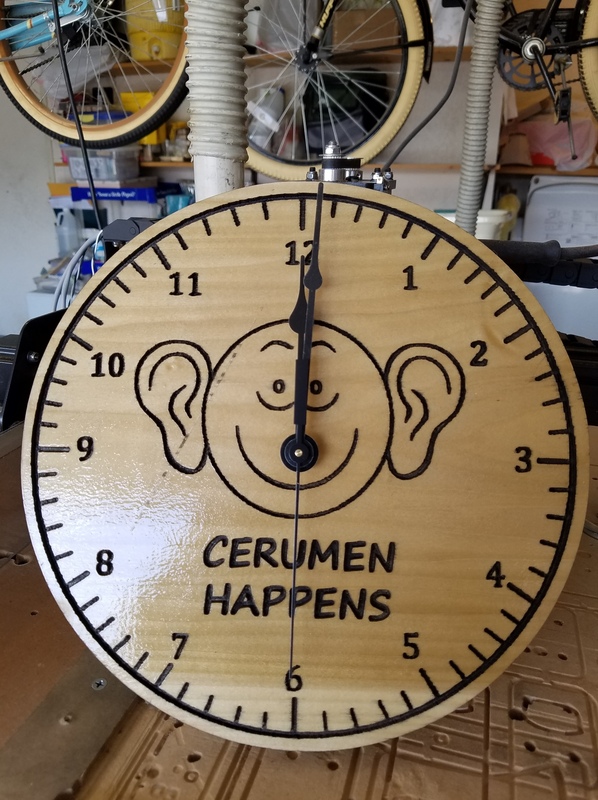 With the help and patience of @PhilJohnson I have completed my first clock. Thanks for the design and help Phil, now to try and design my own. 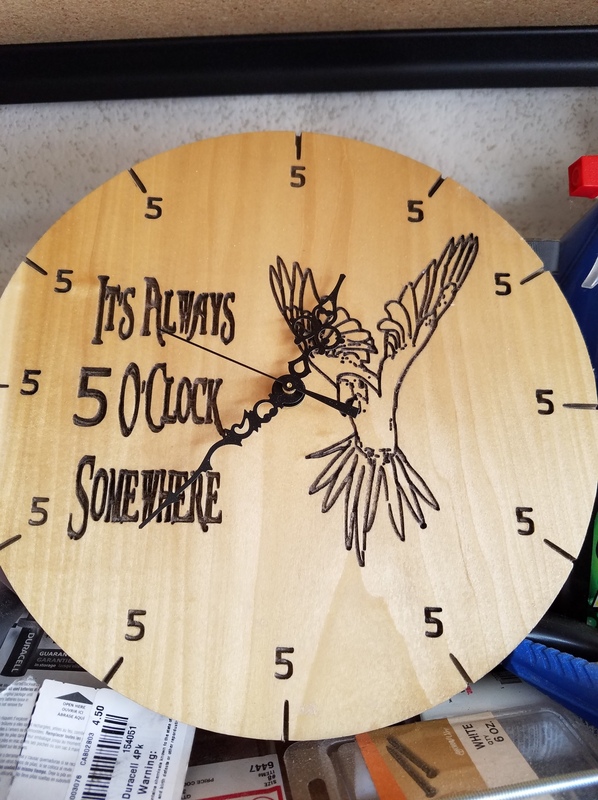 I used poplar and spray shellac, was gonna paint it but the wife liked it like that. I might try some Mohegany. I think I just got lucky with this piece, the last piece I had about two months ago was green. 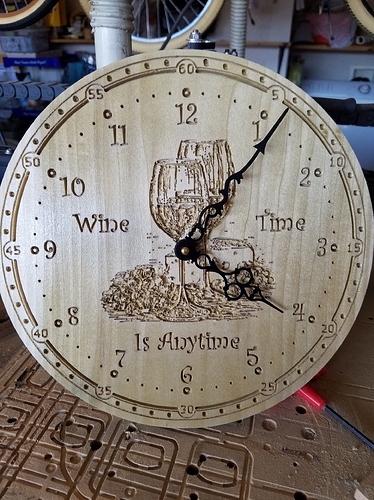 I have seen all these nice clocks. 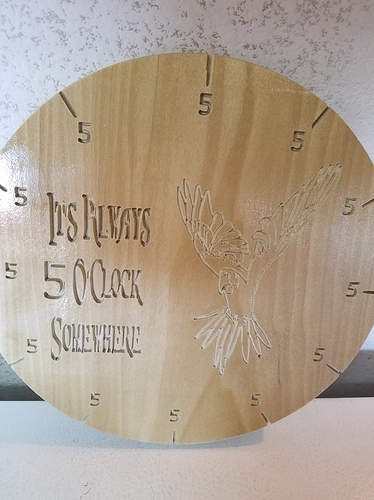 What about custom created clock hands? I could drum up some designs from any ones sketches. I would need the dimensions of the clock hands first of course. I plan on doing one soon. 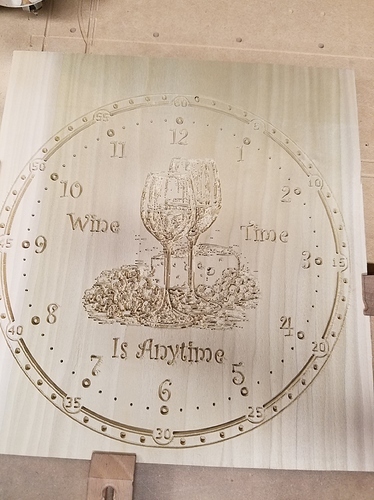 its going to have a relief look or I may do an inlay. This tread is very cool as it gives lots of cool ideas.